Steve Ehlers, unsung hero of cheese. Steve Ehlers was pretty much the first cheese person I met outside of California when I started going to cheese conferences. Many California folks from the slightly earlier generation of the American cheese renaissance helped me develop my practical knowledge, taste, and historical interest in cheese – people like Kathleen Shannon Finn, Andrea London, Ig Vella, Jennifer Bice, Mary Keehn, Judy and Charlie Creighton, Dan Strongin… But Steve was probably the first to show this interested but insecure Californian that he could be part of the cheese world on a larger level. He welcomed me into the American Cheese Society. I don’t remember how we first met – probably when I volunteered to help prepare cheeses for judging at the first Louisville ACS – but I was feeling overwhelmed being at an event where everyone seemed to know each other and I was one of the youngest people there. Back in those days, the ACS conferences were only a couple hundred people and I wasn’t sure I could fit in with the group or, honestly if I wanted to. Steve and I hit it off right away. We had common interests in the world outside of cheese, which always helps, but I don’t know if I have ever met a more friendly supportive person. Later I watched him do the same with plenty of other new cheese folks. He easily could have been too busy – running a shop, being on the ACS board – but he always made time for people. He really exemplified everything I love about the artisan cheese world: friendly, smart, willing to share practical knowledge and oral history, encouraging, disapproving of pretension, non-self aggrandizing, and always seeking out ways to help people in our community and cheesemakers having a hard time. These are the qualities that helped make me decide that I could find a home in the world of cheese. Steve is not the only person I can thank for that, but he’s on a short list. The funniest moment I can remember with Steve, when I really learned he was one of my people, might not be funny to you. Steve and I shared an interest in history and the history of radical political movements of the ‘60s. 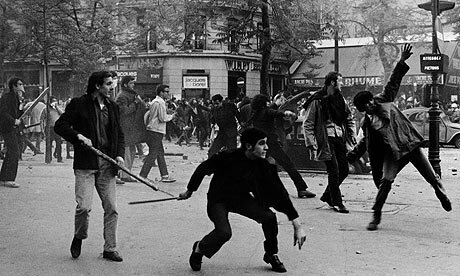 His Facebook icon – not that he ever Facebooked (smart man) — was this iconic picture from the rebellion of Paris ’68. So we were hanging out at a Sheana Davis event during Fancy Food week in San Francisco and I introduced him to a local cheese sales rep. Upon learning Steve lived in Milwaukee, the rep said, “Oh, I have relatives in Wisconsin. My cousin is a weatherman in Madison.” Steve and I started laughing uncontrollably and the rep is probably still trying to figure out what was so funny, not knowing that when we hear Madison and weatherman together in a sentence, we both hear it with a capital W.
We always bonded over being some of the few people at ACS in cheese retail or distributing that stayed in the same job for more than 20 years. It’s a small club. Me, Juliana and Alma from the Pasta Shop, Helder from Zuercher, Patty and Steve from Larry’s Market and a few others… Going to Larry’s was something I did every time I went to Milwaukee. It’s a small but mighty place and it always feels like a home away from home. I can only imagine what his family and closer friends must be going through because Steve was one of those people that just brightened up every room and every interaction. He is a real unsung hero of the American cheese renaissance. It’s actually really hard for me to imagine our community without him. I am going to miss Steve a lot. And I know I am not the only one. This entry was posted in Uncategorized and tagged cheese, larry's market, obituaries, steve ehlers. Bookmark the permalink. Thanks for make time to write this, Gordon. I didn’t know Steve well, so it’s nice to have your reminiscence to round out the picture.